The recently published World Economic Forum report on global travel and tourism competitiveness contains a wealth of data that is significant beyond just tourism. Several data sets pertain to health infrastructure in the 140 countries considered by the WEF. Under the “Health and Hygiene” rubric one finds figures pertaining to physician density, number of hospital beds per capita, access to improved sanitation, and access to improved drinking water. This post will focus on the first two issues, as the latter two sets of figures concern hygiene, rather than health infrastructure or personnel. These figures from the WEF report will be supplemented by data on nurse/midwife density from the World Health Organization, remapped with the same color-coding. 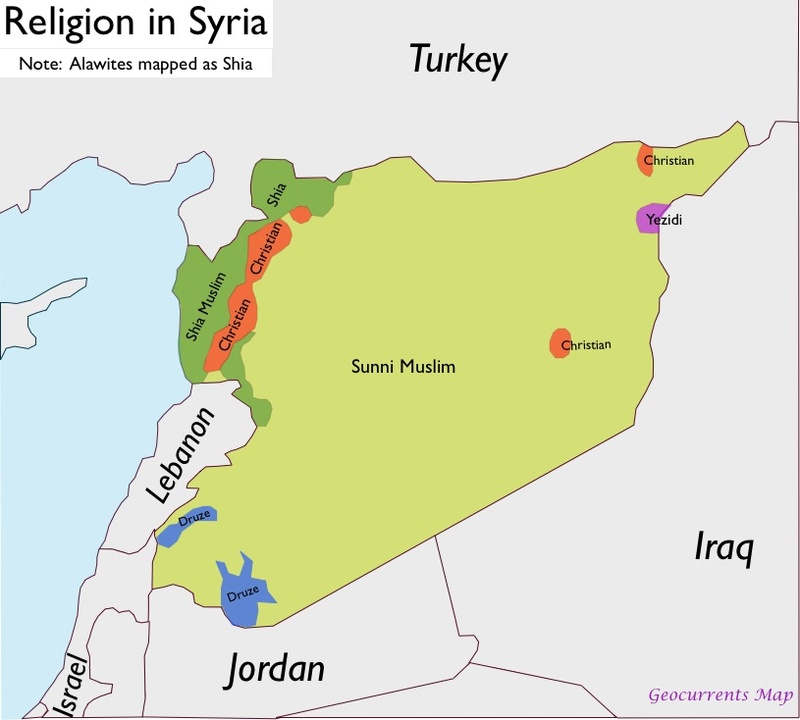 The three sets of figures are mapped; several instructive patterns emerge involving both individual maps and map comparisons. 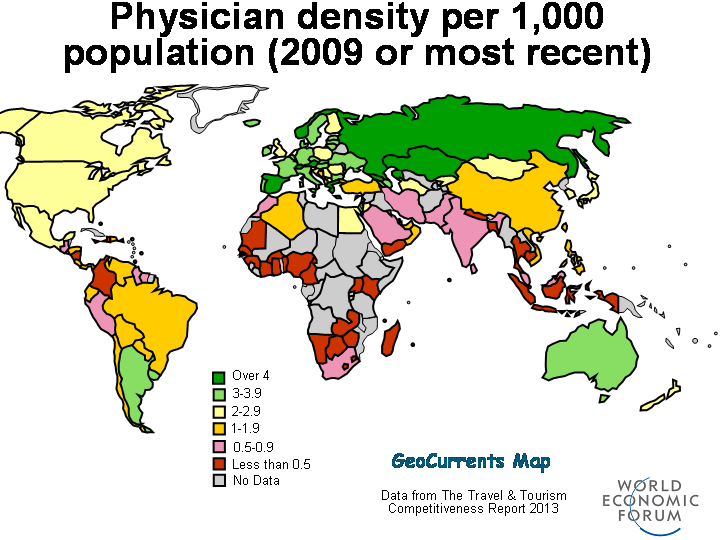 The first map illustrates the global patterns in physician density, that is the number of physicians per 1,000 people. The highest numbers of doctors per capita are found in Russia and some of the former Soviet states, as well as elsewhere in Europe. 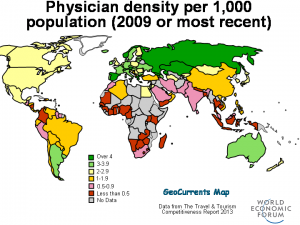 Greece, perhaps surprisingly, has the highest figure, 6.2 physicians per 1,000 inhabitants. Austria and Georgia have slightly fewer than 5, and the only other countries with 4 or more are Russia, Norway, Kazakhstan, Switzerland, and Spain. Portugal and Azerbaijan round up the top ten list. Several Western European countries rank much lower, most notably Finland and the Netherlands (2.9 physicians per 1,000 in each), and the UK (2.7 physicians). In the New World, Argentina, Uruguay, and Australia outrank United States, Canada, and New Zealand. In fact, the U.S. has fewer doctors per capita than Malta, Mongolia, or Moldova. Mexico has the same number of physicians per capita as does Canada (2.0), while other countries in Central and South America lag far behind. Figures for Asian countries range from 2.8 physicians per 1,000 in Mongolia to 0.2 in Nepal. Africa is doing even worse, containing all the bottom twenty countries on the list. Almost all of sub-Saharan Africa finds itself in the lowest category, with South Africa registering a physician density of only 0.8. Despite common preconceived notions, physician density does not correlate well with national wealth measured in terms of GDP. Some of the world’s richest countries—including the U.S., Canada, the UK, and Finland—have fewer physicians per capita than poorer countries such as Ukraine, Kazakhstan, and Moldova. The higher figures in the former USSR are likely a legacy of Soviet times, when doctors were numerous even if not always well-qualified or well-paid. Many of those physicians were and still are female. Moreover, the relative ease of becoming a physician may have something to do with these figures as well. 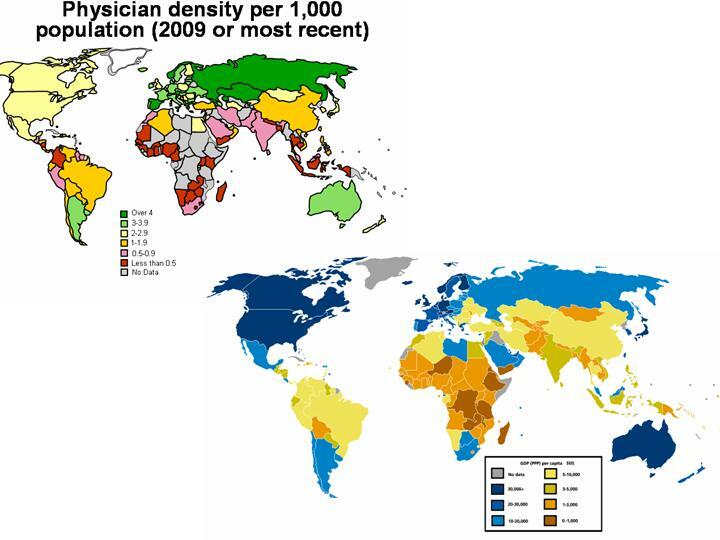 Nor does GDP correlate with physician density if one considers each world region separately. For example, in Latin America, Mexico, Argentina, and Chile are in the same general GDP category, but Argentina has 3.2 physicians per 1,000 population, Mexico has 2.0, and Chile merely 1.0. In Asia, poorer Mongolia is well ahead of richer Japan and South Korea (2.8, 2.5, and 2.0, respectively). As we shall see below, physician density does not correlate with nurse/midwife density or the number of hospital beds per capita either. But first let’s consider those figures individually. When it comes to the number of nurses and midwives per capita (including professional nurses and midwives, auxiliary nurses and midwives, enrolled nurses and midwives, and related occupations, such as dental nurses and primary care nurses), the global picture is rather different from that of physician density. 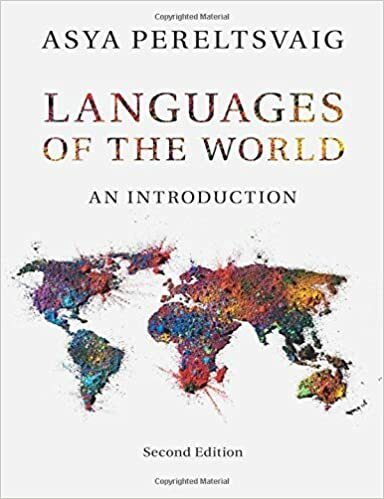 The highest-ranking areas include Canada, Northern Europe, and several countries in Western Europe, such as Germany, the UK, Ireland, and Switzerland. Former Soviet states, with the exception of Belarus, place in the lower categories. Whereas in terms of physician density Europe appears rather homogeneous, with only a couple of former Yugoslav republics having fewer than 2.0 physicians per capita, when it comes to nurse/midwife density, Western Europe is very heterogeneous. 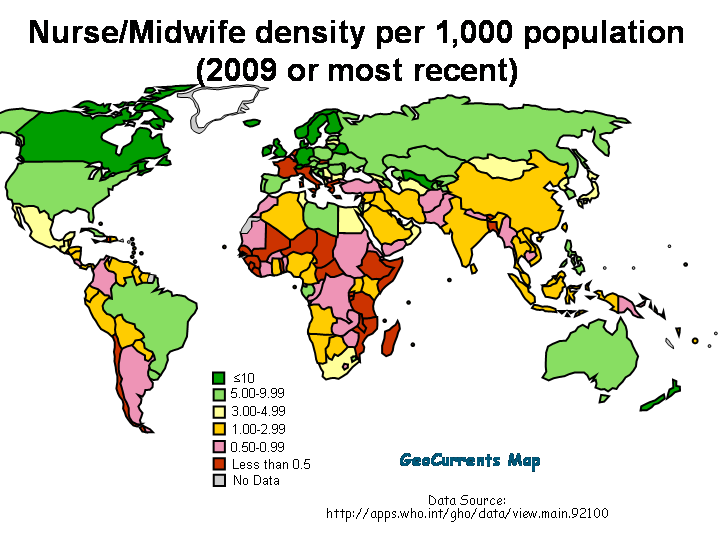 A sharp contrast exists between Switzerland, Ireland, Germany, and the UK, which have some of the highest nurse densities in the world, and France, Italy, Belgium, and the Netherlands, which find themselves in the lowest category, below Colombia, Democratic Republic of Congo, and Papua New Guinea. I am lost for explanation here. 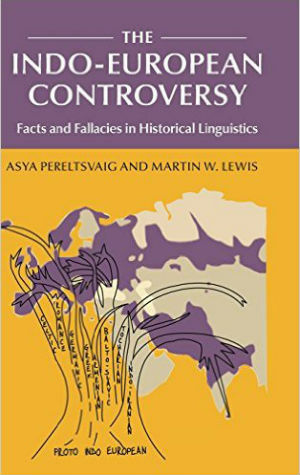 Obviously, national wealth or cultural factors could not have produced the sharp contrast between Germany and the Netherlands, or between Argentina and Uruguay. However, in some cases cultural and economic factors may play a role; for example, the Philippines have more nursing personnel (6.0 nurses/midwives per 1,000 population) than do the much richer countries of South Korea and Japan (5.3 and 4.1, respectively). But the Philippines are also known worldwide for “exporting” well-educated and well-qualified nursing personnel; nursing is the most important occupational niche for Philippine female émigrés. The map of hospital bed density (i.e. 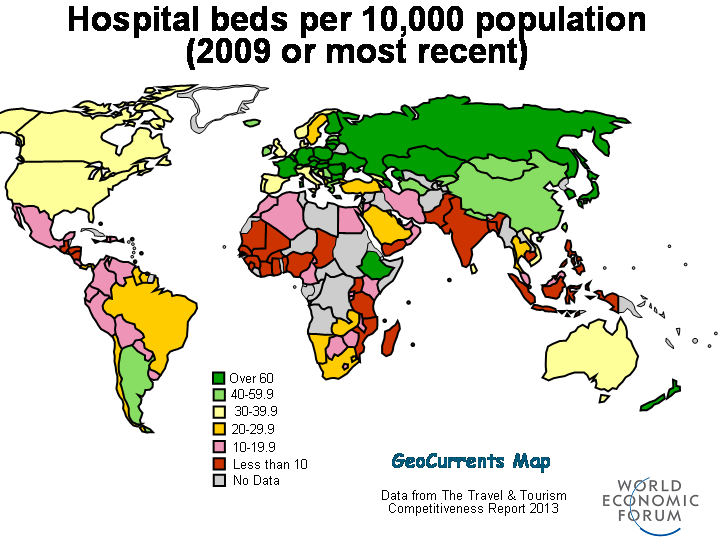 the number of hospital beds per 10,000 population) reveals yet another pattern. * The hot zone, with over 60 beds per 10,000 people, covers virtually all post-Soviet space and most of Central and Western Europe, although exceptions—such as low ranking Spain, Portugal, Italy, the UK, Norway, Denmark, and especially Sweden—stand out. The U.S., Canada, and Australia find themselves in a mid-level category, with 30, 32, and 38 beds per 10,000, respectively. With the exception of Argentina, Latin America places low, as do African countries, except Ethiopia, which has the world’s 20th highest figure in this respect, with 63 beds. Asian countries differ considerably in this respect as well, with Japan and Korea occupying the top two spots (137 and 103 beds, respectively), but with the Philippines supporting only five beds per 10,000 and Bangladesh a mere three. Again, while the explanation for some of these figures can be reduced to national wealth, others do not follow from GDP figures; Ethiopia is a particularly aberrant example. Economic factors do seem to play a significant role in defining patterns of hospital stays. 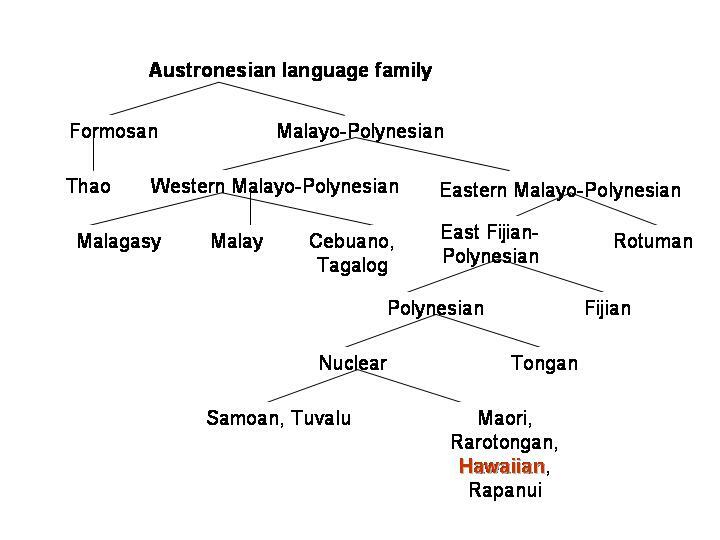 For example, according to the figures published recently by the International Federation of Health Plans, a global network of private health-insurance plans with 100 members in 31 countries, the average cost of an appendectomy in the U.S. is nearly $14,000, almost three times the price an Australian or New Zealander would pay for the same operation, four times what a British or South African patient would pay, six times the price in Spain, and fourteen times what it would cost in Argentina. These high costs of health care in the U.S. have been negatively correlated with the average length of hospital stays. 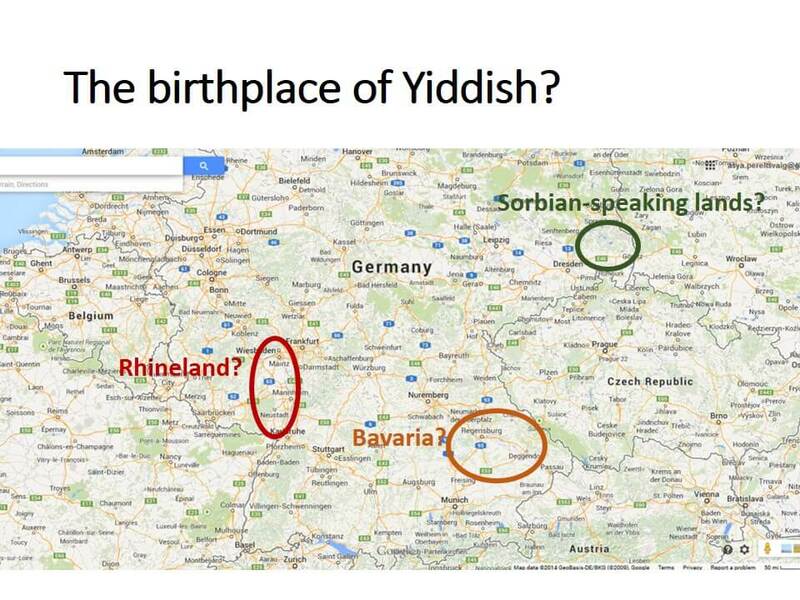 However, cultural factors may be significant as well. Compare, for example, the United States and Russia. In the U.S., which ranks 64th with 30 hospital beds per 10,000 population, patients are expected to stay in the hospital as little as possible, sometimes leaving the day after a heart procedure, a major surgery, or a childbirth. Indeed, according to the OECD figures, the average length of stay in U.S. hospitals for all causes in 2009 was 4.9 days, well below OECD average of 7.2 days. ** In contrast, in Russia, which ranks 3rd with more than three times more hospital beds per capita than the U.S., patients stay in hospitals much longer on average: 13.6 days. One reason for the discrepancy, or at least one correlate, is that in Russia patients and doctors have very different expectations about how care is to be administered and who is to make the decisions about it. Hospital stays are longer because doctors expect to have more control over patient care, deciding not only what treatments or medications are to be used, but sometimes even withholding the diagnosis from the patient. In the U.S., hospital care is much more under the patient’s own control, sometimes exasperatingly so, as doctors expect patients or next of kin to make difficult decisions without the benefit of specialized education and professional experiences. As mentioned above, there is no clear correlation between these three measures of health infrastructure. 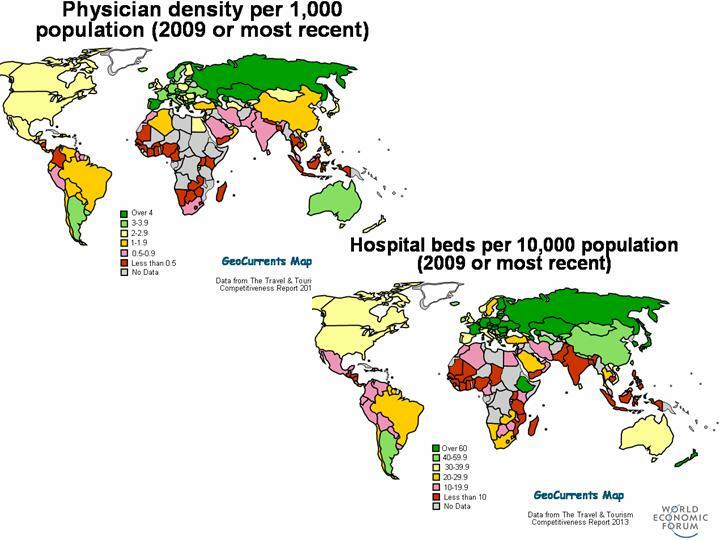 For example, the juxtaposition of the two maps on the left shows that some countries with high physician density have much lower figures for nursing personnel and vice versa. 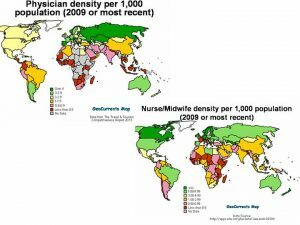 While Russia and Kazakhstan have some of the world’s highest physician densities (in 4th and 6th place, respectively), they are doing much worse in regard to nurse/midwife density. Argentina has more than six times more doctors than nurses per capita (3.2 and 0.5 per 1,000). 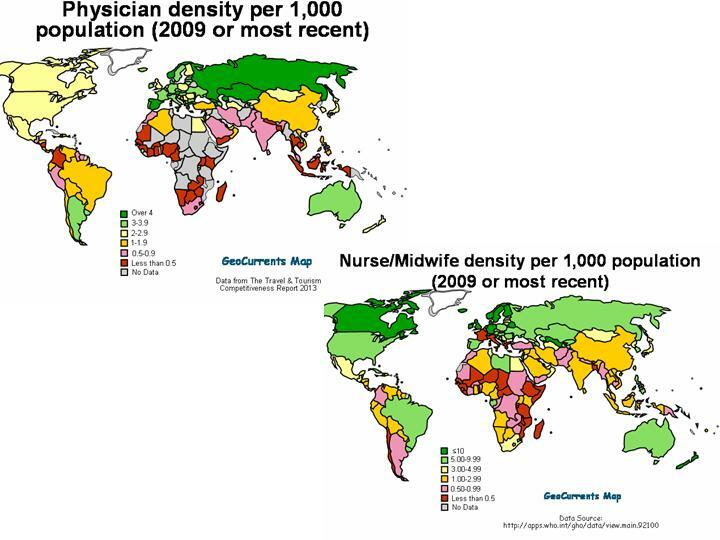 Conversely, New Zealand and Canada rank relatively low with respect to physician density (40th and 58th place, respectively) but have much higher figures for nurse/midwife density. The patterns of physician density and hospital bed density diverge greatly as well. The most striking example concerns Japan and Korea, which, as mentioned above, rank 1st and 2nd in the number of hospital beds per capita, but only 53rd and 57th in physician density. Discrepancies in the other direction can be illustrated by Sweden, which places 11th in the number of physicians per capita but only 66th in terms of hospital beds. 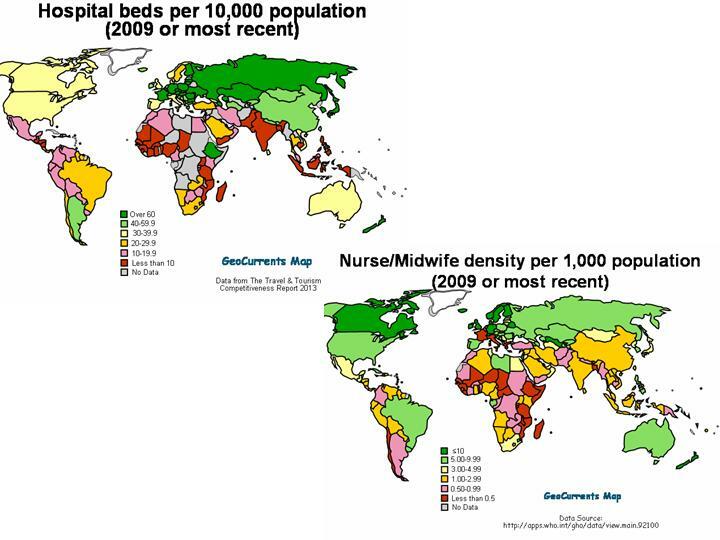 Finally, figures for nurse/midwife density and the number of hospital beds per capita are rather divergent as well. Russia and other post-Soviet countries have very high numbers of hospital beds, but few nurses to care for patients in those hospitals. This discrepancy is fully confirmed by my acquaintances who have had the misfortune to be treated in these hospitals; they agree that patient-per-nurse ratios are still very high and that nursing care leaves room for improvement. The crisis with nursing care in countries such as France, Italy, or Greece, all of which have high numbers of hospital beds but very few nurses, looms large. The situation is much different not only in the U.S., Canada, and Australia, but also in Brazil and Uruguay, which all have much lower patient-per-nurse ratios. Finally, while the intricacies of the health care reform debate in the United States go far beyond the scope of this post, it is worth mentioning that while the opponents of the National Health Care Act argue that introducing a single-payer health care system would lead to a drastic reduction of available health infrastructure and personnel per capita, an examination of figures for countries that have implemented such systems, such as Canada and the UK, and the corresponding figures for the U.S. does not reveal a sharp contrast. For example, the U.S. registered 2.4 doctors per 1,000 inhabitants in 2009, while the corresponding figures for Canada and the UK are 2.0 and 2.7, respectively. Availability of nurses and midwives per capita is actually slightly higher in both Canada and Britain, 10.4 and 10.1, respectively, compared to 9.8 in the U.S. Likewise, the availability of hospital beds per capita is also slightly higher in Canada and the UK (32 and 33 beds per 10,000 population, respectively) than in United States (30 beds per 10,000 population). Conversely, the average length of hospital stay is much lower in the U.S., with only 4.9 days compared to 7.7 days in both the UK and Canada. An American patient with acute myocardial infarction would expect to stay in hospital only 5.3 days, a day less than a Canadian counterpart and nearly three days less than a British patient with the same diagnosis. While the type of health care system undoubtedly plays a role in determining the quantity and quality of care provided, other factors including cultural ones are also crucial. *One thing to note is that it is not clear whether these figures include mental hospitals, as the resulting patterns can be quite distinct. **On the whole, the availability of hospital beds per capita correlates with the average length of hospital stay: the average length of stay in the top ten countries by the number of beds per capita (for which data on hospital stays is available) is 9.5 days, whereas the corresponding figure for the ten countries with the least bed availability (again, for which data on hospital stays is available) is 5.7 days. 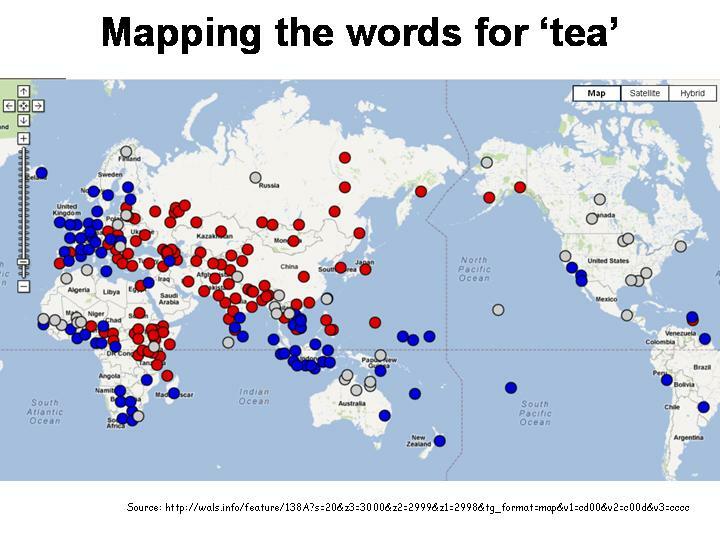 What will you have: tea or chai?